Okay, that we’ve never heard of. The Solituderennen (eng: Solitude race) motorsport events are held on the 11.4 km Solitudering race track near Stuttgart. The event and the track were named after the nearby Castle Solitude. Motorsports events were held there from 1903 to 1965. Due to the narrow track, initially mainly motorcycle events were held there until 1956. 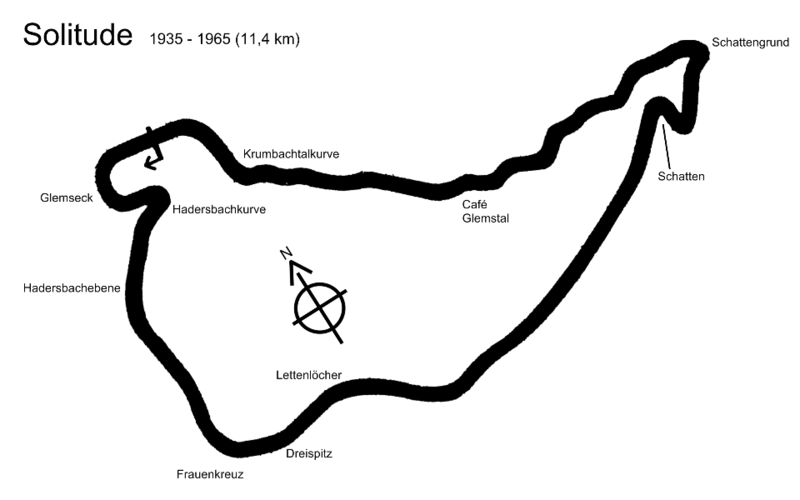 The track and the pits were widened in early 1957 and sports car racing was staged by the automobile club ADAC. Grand Prix motorcycle racing events were held at the track from 1952 to 1964, with the German motorcycle Grand Prix taking place there in even-numbered years: 1952, 1954, 1956, 1958, 1960, 1962 and 1964. From 1961 to 1964, non-Championship Formula One Grand Prix races were also held, in addition to previous Formula 2 and Formula Junior events. In 2003, a memorial event was held, with many former participants and vehicles (source). ~ by velofinds on October 17, 2012. How awesome is that old BMW engine where you can see the parts working? How awesome is that event and how awesome is that film? I studied one year in Stuttgart and right next to my apartment was one pretty nice road. I used to drive it quite often in my ’93 Miata. There was one S-curve where you could get some dab of oppo action with only 115hp. Then one day I came across Solitudering. It was 100% the same road I was driving. Week before I left Stuttgart there was a similar event as in the video, but with bit smaller scale. Nevertheless, you can imagine how it is to see a Gulf-liveried Porsche 917 driving the same corners you have been enjoying yourself. Very nice, Lauri. Thank you for sharing that! Now that you know Solitude, you have to correct the tags of this pic.